A dairy allergy is an allergic reaction to one of the sugars or proteins in milk – commonly casein (protein), whey (protein) or lactose (sugar). Some children will outgrow milk allergies after the age of two or three. Symptoms of a dairy allergy include skin rashes, hives (itchy, red bumps on the skin), dermatitis, eczema, nausea and vomiting, diarrhoea and stomach pains. There is also a risk of anaphylactic shock, which is a very severe allergic reaction and can be life threatening. Symptoms of anaphylactic shock include a rash all over the body, swelling, difficulty breathing and collapse. The only real treatment for a dairy allergy is to avoid milk and dairy in the diet. Accidental exposure to dairy can be treated using antihistamines. In the case of a severe reaction, this can be treated using an epinephrine autoinjector (epinephrine pen). It is essential to call an ambulance if it looks like the child is going into anaphylactic shock. Check the label - many manufacturers will highlight that a product contains milk or dairy. Do be careful, though – not all foods labelled ‘non-dairy’ are actually dairy-free – they are often just very low in dairy ingredients, but this may still be enough to cause a problem in a child with a dairy allergy. It is a lot easier to buy dairy-free products than it used to be – check the ‘free from’ section in the supermarket, or go to a health food shop, or look out for anything labelled ‘vegan’. Alternatives to milk include soya milk, rice milk, oat milk, barley milk, nut milks such as almond, cashew, hazelnut or tiger nut milk, and seed milks such as sunflower seed or sesame seed milk. Tiger nut milk is known as ‘horchata’ in Spain, and is commonly drunk as a cold drink in the summer. Some children with a dairy allergy may be able to drink sheep’s or goat’s milk, but talk to the doctor first – it depends which part of the milk is causing the allergy. Some of the milk alternatives are sweeter or stronger in flavour than the others, so it’s worth trying different ones – some may work better in sweet or savoury dishes, and others may be better over cereal or as a drink. 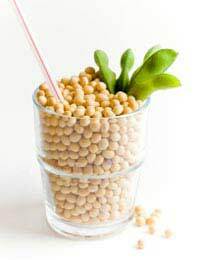 Soya milk is probably the lowest cost alternative, but it does have a distinctive taste. It is very important to make sure that children with a dairy allergy get enough calcium – look out for fruit juices and milk alternatives with added calcium. Leafy green vegetables, almonds, Brazil nuts, sesame seeds and dried fruit also contain calcium. Some milk proteins can come through in breast milk, so breastfeeding mothers with a baby that has a dairy allergy need to avoid dairy themselves. For formula-fed babies, there is a wide range of milks available for babies with allergies. Dairy intolerance is not the same as a dairy allergy. Children with a lactose intolerance do not produce enough of the enzyme lactase, which breaks down milk sugar (lactose). The symptoms include bloating, diarrhoea and nausea after drinking milk or eating milk products. This can be managed by using lactose-free milk, or avoiding milk products. Some children can be intolerant to the milk proteins, with similar symptoms, and this can be managed by avoiding dairy.